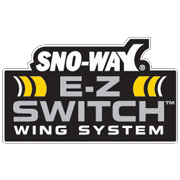 The E-Z Switch™ Wing System is the latest innovation from Sno-Way® specifically engineered to meet your strength, flexibility and productivity requirements. The E-Z switch wing accessories attach to all MegaBlade Series and 29HD plows in seconds using two lock pins. These are not permanent additions so you can easily switch out the proper wing for the proper job in less than 10 seconds. It’s the fasted and most convenient system in the industry! • E-Z Switch™ Mount System Allows Accessories to be Changed in Seconds! • Mount System is Universal with All Wing Accessories! • E-Z Switch Mount System Only Requires Two Lock Pins for Mounting the Wing Accessories. No Drilling or Welding Required for Installation!